Greenburgh has talent—some amazing young people! At many meetings of the Greenburgh Town Board we try to celebrate the accomplishments of some of our future leaders (apologies to Mark Zuckerberg for not being recognized when he was a student living in our town- we learn!). 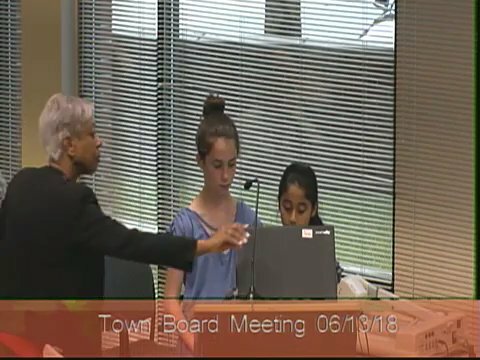 At last night’s Town Board meeting we highlighted students from different schools. Ceremonial Swearing in for Leah Paley and Nidhi Ray as Deputy Town Supervisor for student Recycling - Students at Greenville Elementary School in Edgemont. They are in 5th grade and will be encouraging fellow students to recycle. Sarah Bracey White & Miriam Bernabei –discussed the Artwork from Greenburgh Central School District. Disappointing news: Miriam Bernabei is retiring. She’s an inspiring teacher and passionate about students—a role model for other teachers. If an alumni of the Greenburgh schools becomes a future Picasso Miriam probably will be one of the reasons why. Erika Totoro, winner of the Future Filmmakers Film Festival Award for the most creative film. Erika is a student at Dobbs Ferry and is the granddaughter of Mike Totoro, who ran the Greenburgh Parks Maintenance Division for many years over 25 years ago. Erika showed off her two minute film and is talented just like her grandfather. Savallya Boyini, Student at Alexander Hamilton, nominated for the prestigious Congress of Future Medical Leaders. Joining him was Joseph Engelhardt, principal of the Alexander Hamilton High School and two teachers. It’s great to see school administrators so thrilled at the successes of their students. Section Champions - Ardsley High School Girls Varsity Softball Team Roster 2018 - (Players: Gabrielle Krumper, Danielle Scapperotta, Sophia Mangone, Alyssa Mangone, Sarah Rende, Samantha Blackman, Lauren Rende, Haylee Wootten, Michelle Macri, Giana Strazza, Gianna Musca, Nicole Bergenfeld, Angelina Scalere, Taylor Macri) (Head Coach: Noreen Degnan, Assitant Coach: George Phillips, Athletic Director: Michael Ramponi, Athletic Trainer: Amanda Rivera)---being section champions is a big deal. The Ardsley Girls Softball team should be very proud. At the Town Board meeting last night town assessor Edye McCarthy discussed the assessment changes and answered a number of questions from residents. The discussion starts about 50 minutes into the video link below. Think the discussion will clear up some confusion and misunderstanding.